The Wabash Center is able to provide facilitators for various faculty conversations and work in the area of teaching and learning. Over the years, we have come to know a variety of teaching faculty who are skilled at assisting faculties as they explore, clarify, and address crucial issues of teaching practice and learning theory. 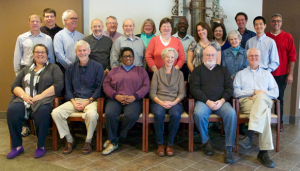 These consultants are available to visit religion departments and theological schools who wish to benefit from structured conversation on pedagogical issues within their institutional settings. As with all Wabash Center programs, the consultants help participants to identify their own questions and issues and enable them to work with these concerns in ways that will advance the purposes and goals as defined by the initiating institution. The Wabash Center provides the stipend and travel expenses for the consultant. We ask that the inviting institution provide all local hospitality, including lodging, food, travel to and from the airport, and other expenses while on your campus or retreat facility. Describe your institutional context and the issue you want to address and we’ll reply to start the process of pairing you with an appropriate consultant. Teaching is a vocation, teaching is a craft, and institutional context matters. Examples of possible topics and conversations and how the process works.